Getting a Group together? Become a Group Leader! If you have a group of 20 or more, you can become a Group Leader. This enables the Group Leader to have the members pay for their share online which makes less work for the Group leader! To make Your Trip and Reserve your spots–follow the directions below or just go for it at Group Leader Login or you can call in for assistance. You do need to set up your group well in advance as one week before your reservation date, the group reservation ability ends, with any ‘unpaid for spots’ being canceled out. You, as Group Leader, will set up an account with your information and a password. You will need to respond to the email from us which makes sure you are real! Then you will login again. You will reserve the number of items you want for your group. Example–reserve for 22 for canoeing, lunch and dinner. If you want to add camping, just add that to your shopping cart for your trip. You will see the selected items in your Shopping Cart. You can change the number or type of items at this point. You will also see the Trip ID number that you give your group. You will need to change the # to be paid (Pay Now) since you do not want to pay for all the spots. You will need to pay for at least one in each category to have the reservation system accept the selection. ie ordered 25 tubes, must pay for at least 1 tube; camping, pay for at least one person.etc. The balance should show the Total for the entire Trip and the amount you are paying for yourself. You will need to agree to and sign the ‘Release of Liability Wavier”. You can then ‘Submit Order’. You will be sent a receipt and the details to give to your group members. You will then let the members of your group know the Trip ID number and the exact Trip Name. They can then login to the QuickJoin form, fill out the Trip ID and Trip name, they will see the items you have reserved for the group. Then they add their selection to the shopping cart and pay for their part. If they want to rent something not on the list, they can make a separate Quick Trip. As leader, you can go back into your account at any time, click on the trip and see who had paid for their items and how many are still unpaid. If you want to pay for more items later, you will log back in and select the trip/reservation, and ‘Pay additional’ for the items.If you want to add more items to your trip, just make a new reservation for those items for that date. This additional reservation will have it’s own ID number and Trip Name so you will give that to your group too. Two weeks before the trip, a reminder email daily will be sent to the leader. One week before another email will be sent that will inform the leader of any items that were not paid and that they will be released. At that point the leader and/or members will need to pay online with a new reservation as a Quick Trip or call in to see if there are any more spaces and pay at that time by phone. The day of the trip, the leader checks in at the desk to finalize the trip. Any additional discounts and ‘leader bonus’ will be done then. Discounts for group leaders and Boy Scouts, Church group, etc. will be given to you at the Desk on your arrival. Cancellation is 48 hours in advance for refund and will need to be called in to the Outfitters. We go rain or shine. 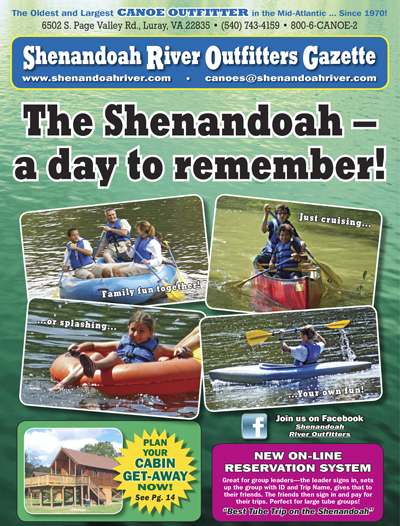 Ready to sign up your Group for your adventure on the Beautiful Shenandoah River? Here is your Group Leader signup form to start your group’s reservations.